The book reveals a startling dark side to the staggering rise in antidepressant prescriptions, alternative medicine, and joy-through-exercise regimens over the past forty years, a revolution that has produced a new “happy class” that is changing the face of America. 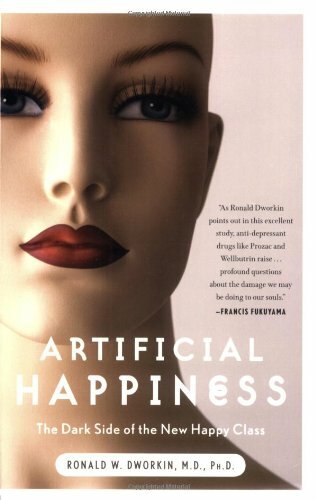 Dr. Dworkin shows that the politics of health care and medical ethics, combined with momentous changes in popular culture, have dramatically altered the relationship between doctor and patient, sown discord within the medical profession, and pitted doctors against clergy, all in the march to create the “Artificial Happiness” panacea. His provocative book spotlights four trends that have revolutionized the modern practice of medicine: the growing use of psychotropic drugs, with doctors compelling patients to take mood-adjusting medications; alternative medicine, with doctors deceiving patients into happiness using nostrums they themselves only half believe in; “fitness culture,” sanctioned by doctors, where people delude themselves into thinking they have accomplished something life-changing through exercise; and the disconnect between religion and spirituality, nurtured by doctors who ape clergymen and promote well-being through activities that are fraudulently spiritual. Dr. Dworkin fits these elements together into a narrative that places Americans at the center of a novel social experiment: helping people feel happy independent of the facts in their lives.